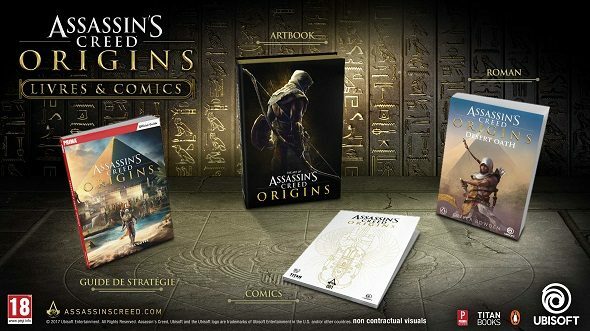 Ubisoft announced a range of tie-in reading material for Assassin’s Creed Origins, the upcoming, Egypt-set instalment of their popular man-stabbing series. As well as an art book and an official guide, there’s going to be a series of comics and a novel. Keep your finger on the industry’s pulse with our list of upcoming PC games. It’s good news for those types who like to dive straight into the lore like it’s an inviting bale of hay. The stories will cover protagonist Bayek’s youth, the forming of the Creed, and more. The artbook will display the concepts and work that’s gone into creating its ancient world. Assassin’s Creed Origins: Desert Oath, published by Ubisoft and Penguin Books, is a prequel, laying out a voyage young Bayek takes, following his father’s footsteps and travelling along the Nile. The novel is written by Oliver Bowden in collaboration with the development team. Meanwhile, the comic series will explore the founding of the Creed, introducing new faces and showing us how historical figures fit into its formation. Assassin’s Creed Origins will be released worldwide on November 7 on PC.